2014 Final Year End Budget Roundup = $294,304.09 or an increase of + $75,566.44 or +34.54% | Save. Spend. Splurge. As you all know, I use my beloved The Budgeting Tool to track all of this, I have been using it since 2006 & all the net proceeds go to charity. I have been doing this since about 2006 (when I was $60,000 of debt from student loans), and it has helped me clear that debt in 18 months. Now, it’s my wealth builder. I created The Investing Tool to track all of this. I have laid out my entire (general) investing plan for myself and Little Bun here with exact funds to buy and in what amounts for both Canadians and Americans (YES I WROTE TWO VERSIONS. I AM INSANE) —– Like a Boss Investing: How I spend only 4 hours a year on my investments. You can make any image below larger by clicking on it. You would think with a baby and starting a new job, I’d be spending a heck of a lot less money and making a ton of it right!? Instead, online shopping has become my undoing. But enough about my #firstworldwoes, let’s talk about my money. Obviously you can see when I actually started working… right? Next year will prove to be even better, I’m sure of it. 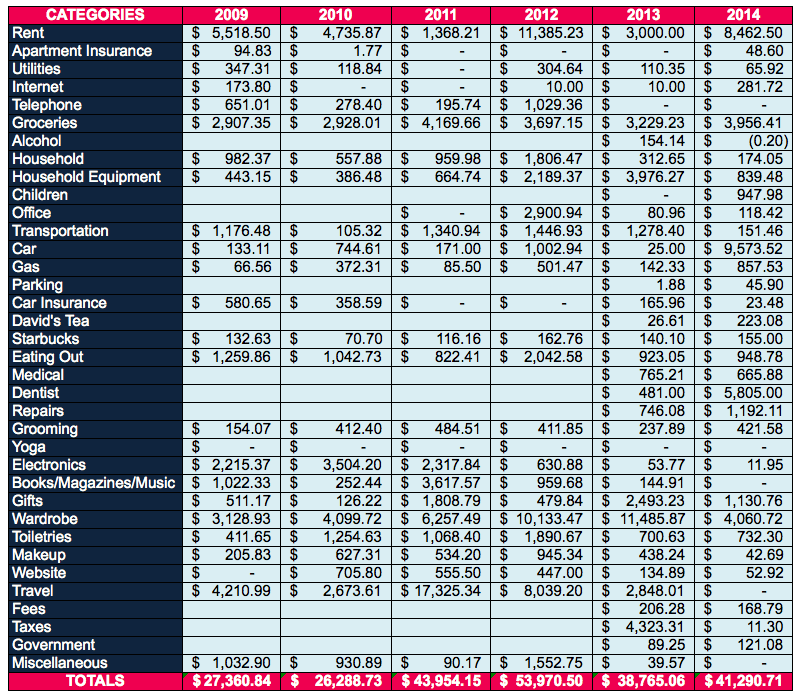 …and just because I’m a huge PF geek, here is my spending since 2009 in chart and numbers. I had to merge and split out a few categories (I can’t make up my mind from year to year which ones should stay or go), and I think I will stop playing around with the categories going forward. And you can see my life in numbers, literally. Rent was the highest in 2012, but this year wasn’t too far behind. 2015 will be the highest in rent, yet. 2014 was THE MOST expensive for a car because I actually bought a real car this time instead of a wreck. Youch. Ditto for the dentist because I got braces in 2014. Surprisingly, 2013, 2012 and even the year of 2011 beat out 2014 in terms of Wardrobe spending. This is good. I want it to be super low for 2015. Travel was a HUGE thing for me in 2011 and 2012. Taxes in 2013. Yuck. That was a nasty year. 2015 will be worse though, I guarantee it.. and 2016 will be THE WORST of all for taxes. Children is a new category because.. BABY BUN! It got better but I want it to be much higher. I can do this, y’all! I’m “picking up steam and getting better”, but REALLY REALLY off from my proposed PF score of 10. In case you missed the post, a PF score is this. 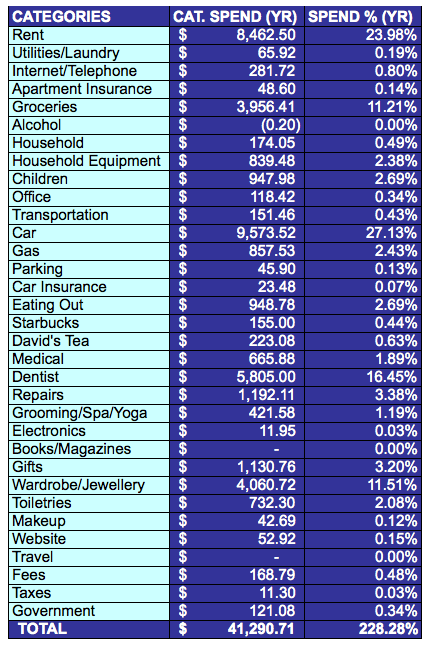 I do this every year, and almost NEVER follow through so you’d think this would get old because I can’t seem to stick to my promises and good intentions… but.. here is my proposed personal budget for 2015. My work-only budget is separate from this.. although in that case, gas, car insurance and parking should all fall under THAT budget, no? Hmm. Must ponder this. So “discretionary” means I can spend it on whatever the heck I want. It doesn’t include things like if I have to get my car fixed. That’s not part of “discretionary”. Tea, macarons (also not considered “eating out” like in a restaurant), or CLOTHING. I really think this will be more motivational than putting a ban on myself. I just need to find the money in the budget to spend as I wish, or carry it over to the next month to save up for what I want. For instance, I am thinking that I want to start getting a massage monthly. That’s a nice, relaxing experience for about $150 for an hour (tip included) that I would really cherish, and it would probably mean a lot more to me than ANOTHER new top. Right? I earned about $79,000 this year in gross income, but I spent around $41,300 in net expenses so truth be told, this is kind of shabby in terms of savings and very misleading. Most of that will be going to taxes, so my REAL savings is going to be $0. Or at least that is what I am telling myself. Realistically, I think my real savings this year was $10,000 – $20,000 net after taxes. We will see when taxes shake out in February 2015. I almost made $6000 in dividends this year but then I sold off a lot of stock (and repurchased some of it at discounted rates). We’ll see how 2015 fares. This is not included as part of my income above because it is all re-invested back into buying more stock. I keep 99% my investments in my registered retirement accounts (RRSP and TFSA), as well as outside of those accounts (regular investing) at Questrade. Ended the year SO.. SO close to $300,000. This will be a given for 2015 within the first week, so I think I’m going to aim for $400,000 as my net worth which will be a stretch especially if this is after taxes. I’m also joining Bridget’s challenge but aiming to increase my net worth by $250 a day, or $91,250 next year (net). Heck, let’s just say a $100,000 increase for the whole year. Net. I should have curbed myself more to hit that $300,000… oh wait. But I did say I’d do that right? Then I saw pretty things to buy and forgot all about it. Note: The net worth numbers start at the end of December 31st 2012 and go until December 31st 2013. My journey from – $60,000 in debt where I am now is in no small part due to the fact that I budget and track my expenses. Baby Bun is doing well! I started the Save. Spend. Splurge. blog (at this URL) last March (2013), so it’s been a year and 9 months. Woo hoo! I was going to do rankings and all that crap but.. meh. I can’t be bothered. I don’t care. If you want to advertise with me, you can do the work and then just contact me if you are interested. I seriously wrote and published 423 new posts in 2014 and I have 289 (as of today) in the works to be published up until 2017. By the way, you can read a SELECTED* archive of my Best Posts of Save. Spend. Splurge. here. …all of which have NOTHING TO DO WITH MONEY AT ALL. So much for being a personal finance blog. I should just call it a “style enabling blog”. What is your Personal Finance (PF) score? How much money does it take to become a top-tier fashion / style blogger? Going to pare down on my wardrobe. Seriously. I say this every year, but THIS YEAR IS FOR REAL. I am not buying any more hangers. Going to buy only practical wardrobe stuff this year and “save” up for them: Lanvin flats and 2 pairs of leggings are on my hit list. Going to try and save $100,000 net after taxes and reach over $400,000 in net worth. Not going to eat out this year unless it’s sushi / Japanese food. It’s my resolution. What are your thoughts on charity? I haven’t seen a charity category in your budgets. Unless you’re hiding it in “miscellanenous”, doesn’t it bother you not to chip in? Again, I’m not attacking or judging you, IT’S YOUR MONEY, but I’m curious what’s your view on this. *shrug* I love clothing and style, and I am not saying people need to spend as much as me, but I have certain standards. 10% of my income goes to charity each year. This is usually why my net worth drops the following month. Haha yeah. In a week actually. I make roughly $5000 a week. Looks like it’s been a great year for you. With that new income coming in (huge!) 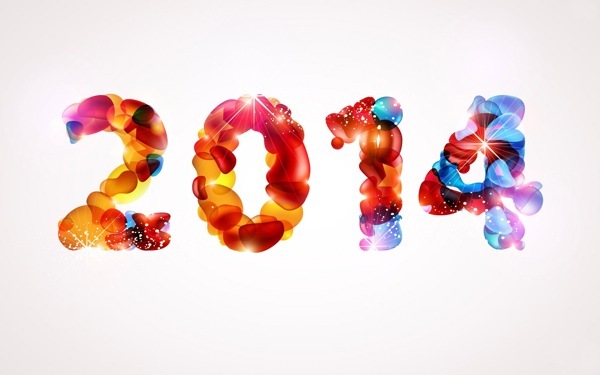 your numbers are going to be amazing in 2015! I am pretty excited too!!! I absolutely LOVE all of the details. Congrats on the baby and 2014’s accomplisments, and many blessings in 2015. 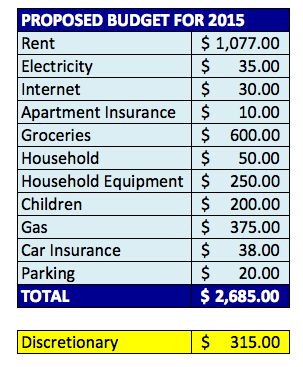 I’m not sure I understand the what the % column on the table with your expenses is supposed to represent, and why is the total at 228%??? Also, when you travel, do you put all the expenses you incurred while traveling into your Travel category? If you bought groceries while traveling, does that go in the groceries or the travel category? If it goes in the Travel category, then that may explain why groceries are higher in 2014 compared to 2013. It is 228% because I spent 228% of my income. Yes, food while traveling even in a grocery store is Travel related as I am not home to cook which results in exactly as you said. Wow, not too shabby for 3 months in the field! Also, I’d totally shop your closet given your fabulous fashion sense, but you are just sliiiightly smaller than I am. Probably for the best (for my wallet, at least). I just downloaded an application on my mobile that tracks my income and spending. And I think, it’s very useful because I can review my spending every day. I put it all in my budgeting tool so I can analyze all of it.